Oregon Grape is a renowned herbal bitter, that has been used traditionally to support healthy digestion and liver cleansing. Like goldenseal, oregon grape contains the potent alkaloid berberine, which gives it its signature golden color. Berberine has been shown to support immune system function, which makes oregon grape root a good alternative to goldenseal. Fresh ecologically wildcrafted oregon grape root extracted in organic ethyl alcohol and mountain spring water. As an herbal supplement, take 15-30 drops in warm water or juice three times daily, or as directed by your health care professional. Fresh Oregon Grape root (Mahonia nervosa). 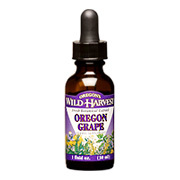 Oregon Grape Liquid is shipped in a discrete, unmarked package. Orders are processed immediately and usually take about 3 to 5 working days to be received. We do ask that you try it for 2 to 3 weeks to feel the full effects. Any information received is used only for order processing and shipping purposes. Your information, such as e-mail address, will never be disclosed to a third party.